If you've got a jailbroken iPhone or iPad and you've grown bored with the stock page transitions (or lack thereof), DisplayCandy can make things a bit more interesting by adding animations for opening, closing, and switching between apps. 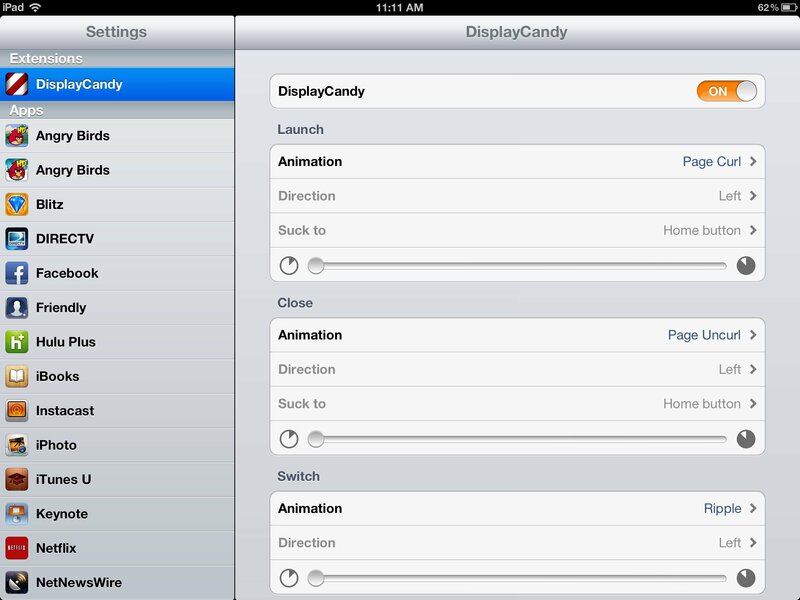 Once you've installed DisplayCandy to your iPhone, iPad, or iPod touch you'll notice that some default animations may already be selected. You can pop into your default Settings app to change them. DisplayCandy currently offers over 10 transitions to choose from. Among them are page curl, ripple, reveal, camera iris, cube, flip, and more. From Settings you can control animations for each type of action separately which means you can choose different options for launching apps, closing apps, and switching between them. The only other option there is to configure is the length of time you want the transition to take. By default it will be set on the fastest option which creates the quickest transitions. You can move the slider to the right in order to slow down the transitions if you'd like. In most cases, you'll probably want the lowest setting so the animations don't inhibit your regular workflow. DisplayCandy is available in Cydia now and will work on any iPhone, iPad, or iPod touch running iOS 5 or higher.